Enjoy modern rooms and high-tech amenities in the center of the action at Courtyard Arlington Rosslyn. Just 3 miles from the nation's capital, our Rosslyn hotel ensures guests are never far from their next educational adventure. 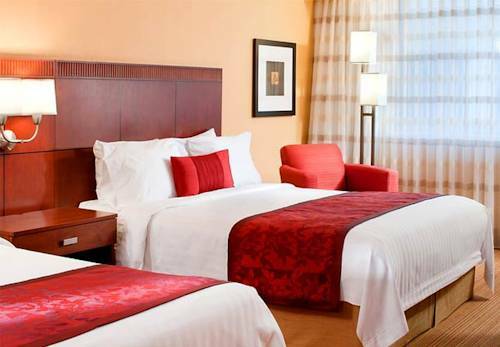 Take convenience to new heights while staying less than 5 miles from Ronald Reagan Washington National Airport (DCA), or take in the scenery on your quick commute from Washington Dulles or the Baltimore airport. After a busy day of travel, break a sweat at our state-of-the-art fitness center. When it's time to unwind, spread out in modernly appointed guest rooms and suites featuring sleek decor, complimentary high-speed Wi-Fi, luxurious bedding and ergonomic workspaces. Visit The Bistro - Eat. Drink. Connect., our popular on-site restaurant, for breakfast and specialty Starbucks beverages in the morning, then return for dinner and evening cocktails at night. Book your next stay at Courtyard Arlington Rosslyn today!